The Cold Case Justice Initiative (CCJI) at the College of Law has learned that the Department of Justice is closing the investigation into the 1964 death of Frank Morris. Through one of its standard, hand-delivered letters, the Cold Case Unit in the Civil Rights Division has informed the granddaughter of Frank Morris, Rosa Morris Williams, that the investigation is at an end. As legal representatives of Morris’ granddaughter in matters pertaining to this DOJ and FBI investigation, the CCJI intensifies its call for immediate congressional oversight hearings. The implementation of the Emmett Till Unsolved Civil Rights Crimes Act of 2008 has been a failure up to this point. Frank Morris in visor. Photo courtesy of Concordia Sentinel, Ferriday, La. The NAACP and the Southern Christian Leadership Conference joined the CCJI in advocating for increased oversight this past summer. Through joint resolutions between the CCJI and these two civil rights organizations, Congress has been asked to look into the conduct of the Justice Department in implementing the Emmett Till Act. 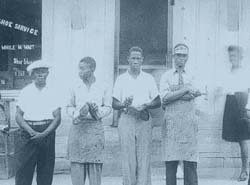 According to existing evidence, at least two men belonging to a local Klan organization broke into Frank Morris’ shoe repair shop on Dec. 10, 1964 in Ferriday, La., trapped Morris inside and set fire to the building. Although he managed to save his 10-year-old grandson, Morris died four days later of third-degree burns over his entire body. Rosa Morris Williams sought the assistance of CCJI in March of 2007. The professors not only agreed to help Williams but Ferriday-based reporter Stanley Nelson at the Concordia Sentinel, who was already aggressively investigating Morris’ death for his newspaper, as well. By late December 2007 the CCJI had provided the U.S. Attorney’s office with the names of witnesses to be interviewed and related documents collected to date that demonstrated a coordinated effort by various Klan groups in Louisiana and across the Mississippi River to Natchez. The co-directors say the FBI and DOJ had important leads throughout the investigation that they summarily dismissed.